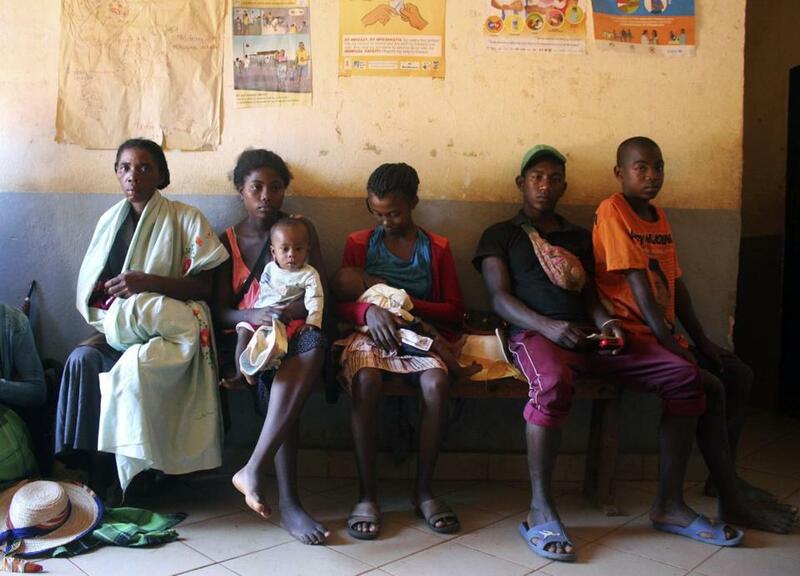 Mothers waited to have their babies vaccinated against measles at a healthcare center in Larintsena, Madagascar on March 21. ‘‘He has a fever,’’ she said. ‘‘I think it’s measles because there are these little pimples that have appeared on his face.’’ The nurse quickly confirmed it. ‘‘I’m so scared for him because in the village everyone says it kills babies,’’ Razaijafisoa said. ‘‘The epidemic unfortunately continues to expand in size’’ though at a slower pace than a month ago, said Dr. Dossou Vincent Sodjinou, a WHO epidemiologist in Madagascar. By mid-March, 117,075 cases had been reported by the health ministry, affecting all regions of the country. ‘‘Malnutrition is the bed of measles, ‘‘ Sodjinou said. ‘‘This is the case for almost all children with measles who have come here,’’ said Lantonirina Rasolofoniaina, a volunteer at the health center. ‘‘Vitamin A is given to children to increase their immunity. We try to reduce the fever. If there is a cough, we give antibiotics,’’ said Dr. Boniface Maronko, sent by WHO to Madagascar to supervise efforts to contain the outbreak. If the disease is not treated early enough, complications appear including diarrhea, bronchitis, pneumonia and convulsions. For a few days she did not worry: ‘‘I felt like he was healed.’’ But one morning she noticed he had trouble breathing. Later she found his feet were cold. ‘‘Look at my baby,’’ she told her mother. Ravonjisoa said she blames herself, ‘‘but I did not imagine for one moment that he was going to die.’’ At the hospital, a doctor confirmed that her baby died of measles-related respiratory complications. ‘‘But immunization is not the only strategy for the response to this epidemic. We still need resources for care, monitoring and social mobilization,’’ said Sodjinou, the WHO epidemiologist.